Starring: Nicolas Cage, Eva Mendes, Val Kilmer, Fairuza Balk, Shawn Hatosy, Alvin “Xzibit” Joiner, Brad Dourif, Jennifer Coolidge, Tom Bower, Vondie Curtis-Hall, Irma P. Hall, Shea Whigham, Michael Shannon. To remake Abel Ferrara’s raw and gritty 1992 film “Bad Lieutenant” that had one of cinema’s most daring performances from the brilliant Harvey Keitel would be foolish and unwise. In fact it would be lunacy. Thankfully director Werner Herzog and star Nicolas Cage are well aware of this and produce something altogether different (with a fair amount of their own brand of lunacy). 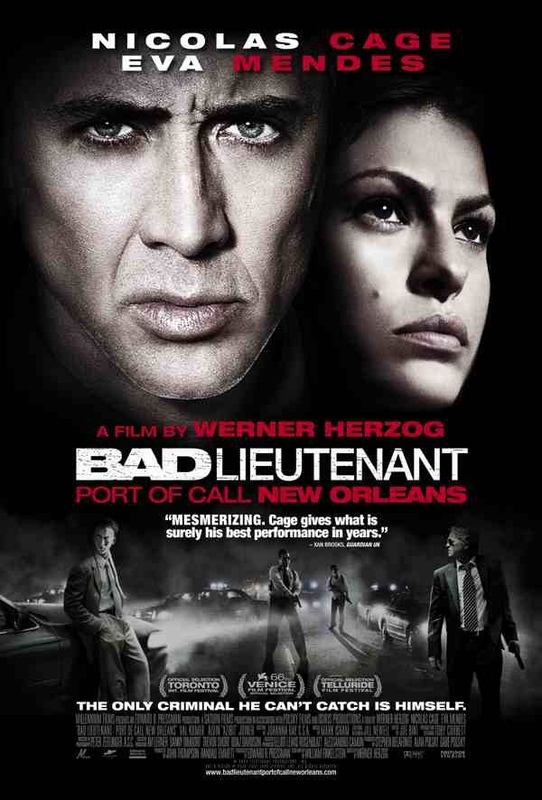 Set in New Orleans post hurricane Katrina, Lt. Terrance McDonogh (Cage) injures his back in an uncharacteristic moment of decency in helping a convict from drowning. This injury leads to a heavy reliance on drugs to get through each day but in his own words “Everythin’ I take is prescription…except the heroine”. Lt. McDonogh is indeed a “bad” one. He shakes down the local gangsters and innocent nightclubbers just to get his next hit and also has gambling debts spiralling out of control. Meanwhile, he is trying to look after his prostitute girlfriend (Eva Mendes) and alcoholic fathers dog while investigating the execution style murder of a Senegelese family and having hallucinations of Iguanas and dancing spirits. It is inevitable that comparisons will be made between Ferrara’s and Herzog’s films but aside from sharing the same title and having a corrupt cop as the protaganist, that’s as far as the comparison goes. Herzog goes for a more humorous approach which in turn relies heavily on a solid performance from his lead actor in order for it to work. 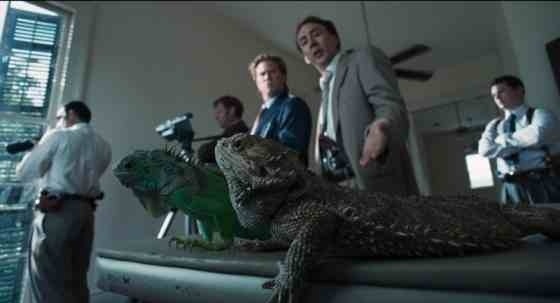 Thankfully, Nicolas Cage does not disappoint. He is brilliantly over the top and yet subtle in other ways and delivers his best performance in a long time. Cage’s subtle moments of wincing and the stiffness in his movements, constantly remind you of the cronic pain his character is in. Not to mention his more outlandish behaviour when high on drugs. This is the Nic Cage of old and actually has you on his side, despite the fact that his character is one of the most unsympathetic he has played. This entry was posted on January 17, 2012 at 10:59 pm and is filed under Crime, Drama with tags 2010. You can follow any responses to this entry through the RSS 2.0 feed. You can leave a response, or trackback from your own site.